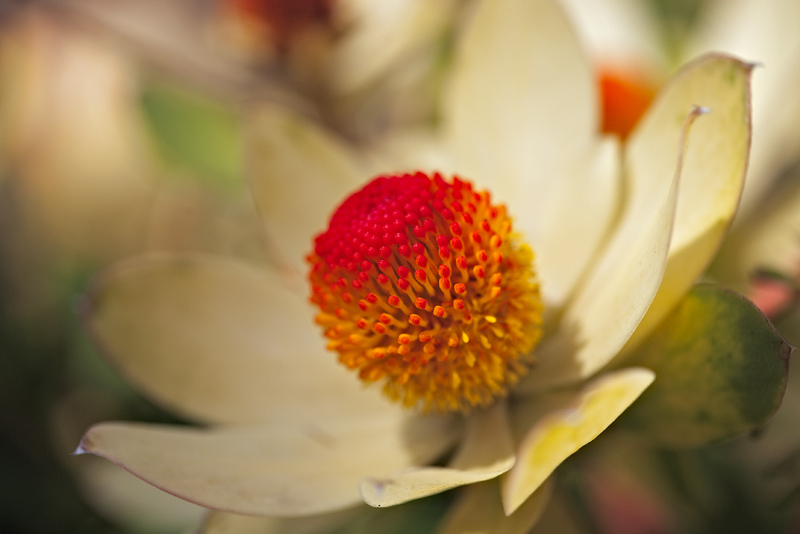 Leucadendron discolor, commonly known as the Piketberg conebush, is native to only a small part of Western Cape Province in South Africa. In 1998, it was assessed as globally endangered, as fewer than 5000 individual mature shrubs (or small trees) were known to remain, all within an area of 20km2. However, this species of rocky sandstone soils is found in cultivation in areas like California and Australia. Today’s photograph is from the San Francisco Botanical Garden, while frequent contributor to BPotD, Eric in SF@Flickr, has shared a (better) photograph of a plant from the Santa Cruz Arboretum: Leucadendron discolor. Definitely need this species for my new garden. There is a great L. discolor x L. gandogeri hybrid called ‘Cloudbank Ginny”. I am quite impressed with this Beautiful Photo of a very unique plant that I would love to see come into the San Diego area. Thanks Daniel.